You can watch their appearance at the ITV Player site here (registration required). The segment on MS Awareness Week begins 11 minutes into the show (8:44 on-screen time). Jackie and Laurence highlighted the work of MS nurses, which is the MS Trust’s focus for MS Awareness Week this year. 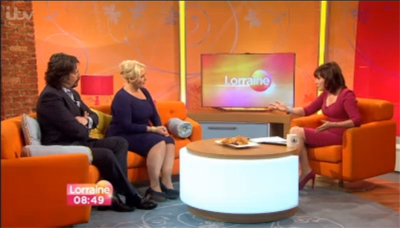 Lorraine: Absolutely. They really make all the difference in the world. Laurence: They do. On a logistical level. Obviously the research needs to continue, but the day-to-day practicalities to help people with MS, and to help their families as well, is critical. At the MS Trust we believe one of the best ways to support people with MS is to support their specialist nurses. But, as we know, there are still gaps in the existing service. If you have had a problem finding an MS nurse read our blog post about what you can do.